Details of the new exam that will replace GCSEs in England will be unveiled on Monday, it has emerged. The new single exam qualification will be introduced in 2015 with the first students sitting the tests in 2017. Monday's announcement comes after disagreements within the coalition over the planned changes were settled. It was originally scheduled for Tuesday. Meanwhile, the Welsh government has said it will not rush into a decision about the future of GCSEs in Wales. Welsh ministers are instead waiting to hear the findings of a review which is due in November. However, the Education Minister for Wales, Leighton Andrews, said in June that Wales would not return to O-level-style exams. In England, Labour has said it supports more rigorous exams, but only if they do not act as a cap on aspiration. When Michael Gove's original plans for a GCSE replacement were leaked earlier this year the talk was of two exams - a new, tougher O-level style test and an easier one for the less academically able. This triggered warnings from teachers about a return to a "two-tier exam system" and has since been played down. Instead, the education secretary has stressed that he wants a qualification for the vast majority of students, even if top grades are in future reserved for "high-flyers". Mr Gove has suggested that pupils might sit the qualification at 17 or 18 if they don't feel ready at 16. The exam will also have a greater spectrum of questions within a single paper, graded from easy to hard to show their difficulty. According to the education secretary, it is his exams - already dubbed the Gove-level - that will give everyone a chance to shine. But some in the education world doubt it is possible to design a qualification that is both more academic and more inclusive. Education Secretary Michael Gove wants to replace GCSEs with tougher exams as he believes pupils in England have been slipping behind high-achieving nations such as Finland and Singapore. An end to the modules and continual assessment which are a key component of GCSE exams has already been announced. Monday's briefing will also confirm that Mr Gove has dropped plans for a two-tier exam system - with more academically-able students taking an O-level type exam and the rest taking an easier test. That proposal was opposed by Deputy Prime Minister Nick Clegg, a disagreement that is now understood to have been resolved. Mr Clegg and the education secretary will present the new exam together on Monday, and Mr Gove is expected to make a statement to parliament in the afternoon. The move would be the biggest change in the exam system in a generation. GCSEs were introduced in the late 1980s, to replace the dual system of O-levels and CSEs, with the first GCSE exams taken in 1988. Pass rates have gone up every year except for this one, drawing claims that they were getting progressively easier. The move comes amid controversy over this year's GCSE exams in English and whether they were too harshly graded. This weekend examiners in Wales are regrading English papers taken under the WJEC examining board, after Welsh Education Minister Leighton Andrews ordered a review of results. Shadow education secretary Stephen Twigg said it was wrong to be thinking about changing the system while the row over this year's grades continued. He said: "Politicians should not set an artificial limit on the number of top grades, rather the best work should be rewarded. "New exams should ensure that young people are prepared for the world of work and the jobs of the future. However, it is not clear how this new system will ensure a breadth of knowledge and skills and that pupils continue studying English and maths until age 18. "There has been no consultation on these plans, rather they have been drawn up in secret and leaked to select media outlets." The Welsh government is consulting on whether new qualifications for 14 to 16-year-olds should replace GCSEs or whether Wales should follow what happens in England. 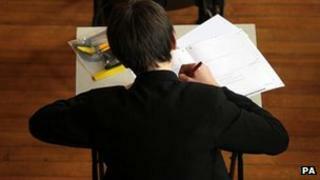 Pupils in Northern Ireland take GCSEs; there are no planned changes.